Sure, when Tom Hanks was on The Late Show on Thursday, it was to plug his Oscar-nominated (we’re just assuming) role as former Washington Post editor Ben Bradlee alongside Oscar-nominated (again, safe bet) Meryl Streep in Steven Spielberg’s The Post. But lest America forget that, in addition to being the most beloved dramatic actor in the world and so on, Tom Hanks is also a prime goofball, he and host Stephen Colbert also recorded a delightfully silly bit during his visit that Colbert unveiled on Friday’s show. Serving to underscore how both Hanks and Colbert—despite their usual roles as liberal standard-bearers and respected performers—remain at heart a pair of gamely playful bing-bongs, the bit saw Hanks solemnly responding to some truly difficult either-or questions about his fictional roles’ relative heroism. (Apollo 13's Jim Lovell or The Post’s Bradlee? Woody versus Sully?) 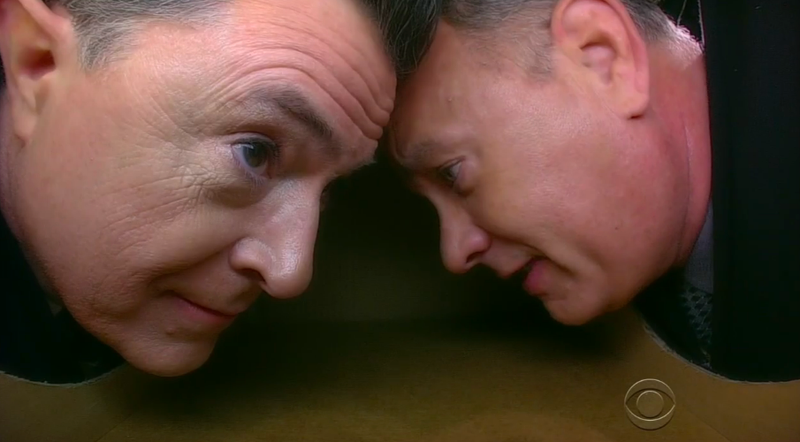 Hanks stood up under Colbert’s nose-kiss-proximity grilling admirably, even asking to remain in their shared, low-tech bubble for some extra face time, if you will. So Errol Morris can have his fancy Interrotron—let’s see his interview subjects cope with some real personal space like Tom freaking Hanks.